If the top floors of Taco Bell's international headquarters in Irvine, California, operate like Willy Wonka's whimsical factory and give rise to some of the world's most adventurous food creations, the basement is more like the warehouse at the end of Raiders of the Lost Ark. The winding hallways and storage rooms found on the level are filled with dusty artifacts from Taco Bell's past. Most of the items you'll come across down there are as insignificant as old stockpiles of Styrofoam cups. But look hard enough, and you just might also unearth the fast-food equivalent of the Ark of the Covenant. When Matt Prince, PR Manager at Taco Bell, stumbled into a giant chrome monstrosity in the depths of corporate HQ a few weeks ago, he knew it wasn't just any old forgotten relic. He suspected the machine might be… it. "I've heard rumors about the machine before," Prince said. "It was just sitting in one of the corners of our development lab. I bet 98% of the people that work here never ventured down here, and I bet the 2% that did never thought this thing was anything more than a storage unit." After hearing whispers from former employees that a machine designed to make tacos automatically was lurking somewhere inside Taco Bell HQ, Prince felt compelled to scour the basement in search of the unit. "Until I actually saw it with my own eyes, I didn't believe it really existed," he said. 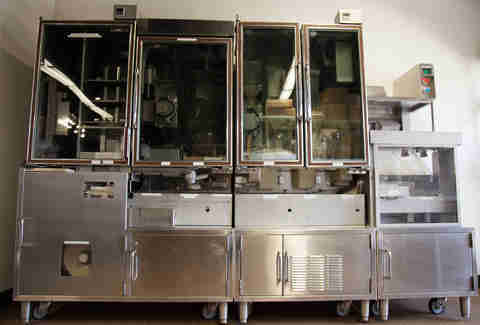 This is the story of Taco Bell's Automatic Taco Machine -- an early experiment in restaurant automation that burned bright for one brief year, then fizzled into fast-food obscurity. This is the cautionary tale of the Taco-Matic, one of Taco Bell's boldest experiments completely lost to the annals of time. Until now. Who would need an Automatic Taco Machine? "Basically, in the early '90s, the demand for tacos was so extreme we needed to figure out a way to make our kitchens more efficient," Prince said. "So our engineers were tasked with figuring out a way to churn out tacos faster." Instead of thinking about streamlining the kitchen process, the engineers decided to re-think the taco-making process completely. To innovate the industry like Henry Ford blew the lid off horseless carriages. Instead of using employees to make the tacos, why not move them to a customer-facing role and have a machine do the dirty work? "What they came up with was a machine that made 900 tacos an hour. It was the first of its kind… and pretty much the last of its kind, too," Prince said. The machine used an internal assembly line, going through the motions of taco building (adding meat, lettuce, tomatoes, and sauce mechanically) before popping out a fully formed taco every four seconds. Three ATMs were made and rolled out to three separate stores in Southern California, where they essentially replaced the kitchen staff. They were efficient. They were precise. And they did exactly what they were supposed to do. But as we learned when John Henry faced down his steam engine (and won), sometimes labor isn't simply a function of speed and exactness. Sometimes the human spirit can triumph over a machine. Every Taco Bell item is made manually. The fast-food maestros on the line meticulously dole out each ingredient by hand and precisely form every order that comes down their line. One Taco Bell manager we interviewed once called TB the "hardest fast-food restaurant to work at" due to the restaurant's policy of making employees weigh each and every ingredient to order in a way one might say is robotic. Yet when actual machinery did that same meticulously robotic work, customers weren't having it. "Customers could tell the tacos were different," Prince said. "They came out fine -- the machine worked well, don't get me wrong. But there was just something different about them that the customers did not like." That, and the Automatic Taco Machine had a habit of breaking down, as most heavy machinery does, and leaving the kitchens taco-less. And since Automatic Taco Machine technicians aren't very easily found in Southern California (or anywhere) there wasn't a quick fix. "Ultimately, it was just way ahead of its time. It did what it was supposed to do. But the world just wasn't ready for it. And it just didn't fit in with what people wanted at the time," Prince said. Yet even though Taco Bell's experiment failed, the drive to automate facets of fast food continues throughout the industry. As anyone with internet access or any semblance of awareness knows, automation and robotics are steadily taking over most industries in the world -- fast food being no exception. Last year the Pizza ATM hit the campus of Xavier University, with plans to expand in the US and Canada. McDonald's has introduced touchscreen ordering kiosks to some of its stores (with plans to expand). Even Taco Bell has implemented touchscreen ordering systems into some of its stores, but the chain learned from the Taco-Matic's failure: The screen-based systems allow employees to spend more time crafting quality food and make sure orders are as precise as possible. So employees shouldn't lose jobs because of automation. In fact, it should allow staff members to focus on the stuff that really matters. Brad Templeton, futurist and Networks & Computing chair at Silicon Valley's Singularity University, agrees. "So far the news has not been bad," he said. "Some jobs will become obsolete with this new technology. But machines have been taking jobs from humans for hundreds of years. There are more bank tellers now -- after the advent of the ATM -- than there ever have been. I think about this a lot. When machines take our jobs, we always find other jobs to take their place. I believe that will be the case here." If Taco Bell's misguided experiment in automation showed the fast-food world anything, it's that automation can't be used as a quick fix in every area of the industry. For robotics and next-gen tech to work in this context, it needs to work in conjunction with human employees, not in place of them. "Look, automation is something that's coming to our industry and we're going to continue to explore that," Prince said. "But there's a time and place for it. It can't replace everything our employees do. It just can't work that way." So they aren't going to dust off the Taco-Matic and give it another shot? "No. I think we learned our lesson there," Prince said. "Also, I'm not sure if it even works anymore." 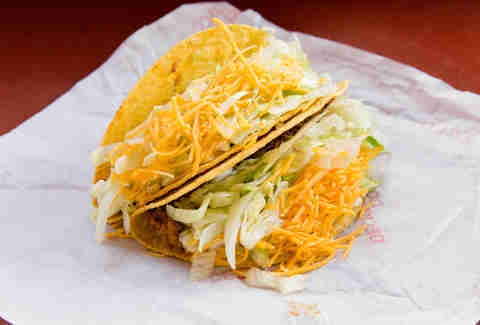 Alas, Automatic Taco Machine, this world was never meant for one as beautiful as you.